I read this article and found it very interesting, thought it might be something for you. The article is called In 4 Years, 200% More Indians Exposed To Heatwaves. Farms Hit As India Accounts For Half Of Global Labour Loss https://www.indiaspend.com/in-4-years-200-more-indians-exposed-to-heatwaves-farms-hit-as-india-accounts-for-half-of-global-labour-loss/. Mumbai: India experienced an additional 40 million heatwave exposure events in 2016 as compared to 2012, raising concerns over a “dangerous surge” in negative health impacts, according to a new study. A heatwave exposure event refers to one heatwave, being experienced by one person. The frequency, intensity and duration of heatwave events in India have also increased over the past half-century and the country will likely be among the worst affected by climate change given its “weaker health systems and poorer infrastructure”, the study said. These are the findings of a study called Lancet Countdown: Tracking Progress on Health and Climate Change--a global, interdisciplinary research collaboration between 27 academic institutions and inter-governmental organizations, including The Public Health Foundation of India (PHFI) and The Centre for Environmental Health. Tracking 41 indicators across finance and economics, public and political engagement, mitigation actions, vulnerability and more, the study uses data compiled by the Lancet Countdown, which documents the human impacts of climate change and provides public health recommendations in response. Since 1990, every region of the globe has become steadily more vulnerable to extreme increases of heat, the study found. In 2017, 157 million more people globally were exposed to heatwave events compared to in 2000, with the average person “experiencing an additional 1.4 days of heatwaves per year over the same period”. Increased exposure to heat can cause a decrease in labour output, exacerbate urban air pollution, burden health systems ill-equipped to cope with the effects of heat stress and promote the spread of diseases like cholera and dengue fever across endemic areas. “Climate change threatens to undermine the public health gains of previous decades and is one of the great existential threats of this century”, said Nick Watts, Executive Director, Lancet Countdown: Tracking Progress on Health and Climate Change. “In the past we have seen the health profession and medical profession come together and move mountains in response to the health risks from tobacco, HIV and polio,” said Watts. “We need a similar response to climate change”. India already bears significant “social and economic costs” from climate change, with each additional tonne of carbon dioxide emitted costing India $86 -- almost double the expense borne by the USA ($48) and Saudi Arabia ($47), according to this 2018 paper published in Nature Climate Change, a scientific journal. This year the Intergovernmental Panel on Climate Change (IPCC) warned that if the global community are not able to limit a temperature rise to 1.5 degrees as forecast, climate-related risks to livelihoods, food security, health, water supply and human security will further intensify, IndiaSpend reported in October 2018. It is therefore “of prime importance” for India to reduce its carbon emissions and air pollution levels, specifically targeting the use of coal, oil and natural gas. While a number of sectors have begun “a low-carbon transmission”, overall slow progress and lack of preparation for the effects of climate changes across the past two to three decades is threatening “both human lives and the viability of the national health systems they depend on”, the report warned. 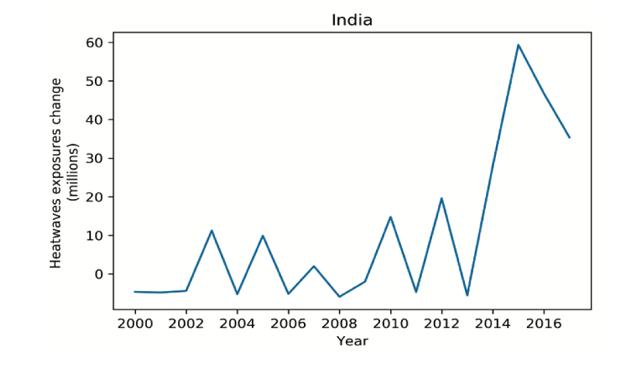 Over the last two decades, there has been a “marked increase” in the the duration of heatwaves in India, as well as the numbers of Indians exposed to heatwaves the report said. The average duration of a heatwave has increased by 150%, from 2 days in 2012 to almost 5 days in 2016. The number of people across the country exposed to extreme heat events has also been increasing. In 2012, just under 20 million people were exposed to heatwaves, compared to 60 million in 2016 -- a 200% increase. Heat exposure can increase the risk of multiple diseases and lead to heat stress -- illnesses which occur as a result of the body’s inability to prevent its temperature rising from beyond a normal range. Severe heat stroke, occuring when the core body temperature rises above 40 degrees celsius, can lead to multiple organ failure, seizures and death, the study said. Advance implementation of local Heat Action Plans, plus effective inter-agency coordination is a vital response tactic which the government can deploy in order to protect vulnerable groups, the study suggested. This will require identification of “heat hot spots”, analysis of meteorological data and allocation of resources to crisis prone areas. India lost nearly 75 billion hours of labour in 2017 as a result of rising temperatures “making sustained work increasingly difficult or possible” and negatively affecting workers’ output. This is an increase of over 30 billion hours since 2000 and represents under 50% of the total hours of labour lost globally (153 billion hours) in 2017. The agriculture sector experienced the largest increase in labour loss, with 60 billion hours lost in 2017, up from 40 billion in 2000 -- a 50% increase. 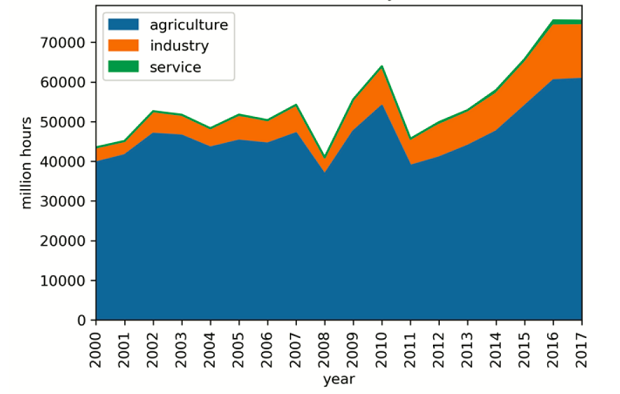 While the industrial and service sectors also saw a similar trend in the reduction of labour hours between 2000 and 2017, the indoor and less strenuous nature of these types of jobs meant losses were not as significant as the agricultural sector. The substantial “climate-related impacts” on the workforce and economy could be significant for India, with 18% of the country’s gross domestic product (GDP) tied to the agricultural sector, the report said. Equally, a fall in living standards, due to reduced precipitation and temperature changes, could therefore affect just over half of the population who are employed in agriculture related jobs. An urgent review of occupational health standards and labour laws that regulate maximum working hours and safe working conditions must be carried out, the study said. 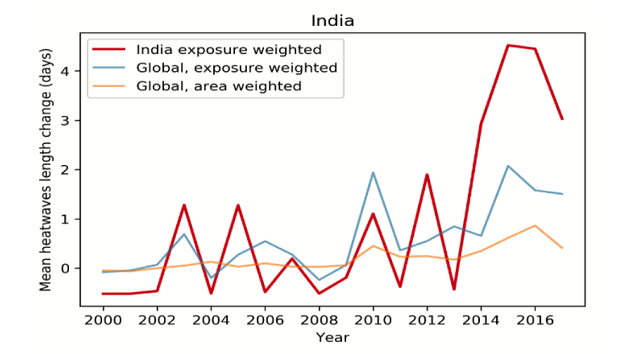 India’s dependency on fossil fuels is contributing to high levels of ambient air pollution containing PM 2.5 -- fine particulate matter 30 times finer than a human hair, which are known to pose the greatest risk to humans-- and which in turn is translating into premature deaths. 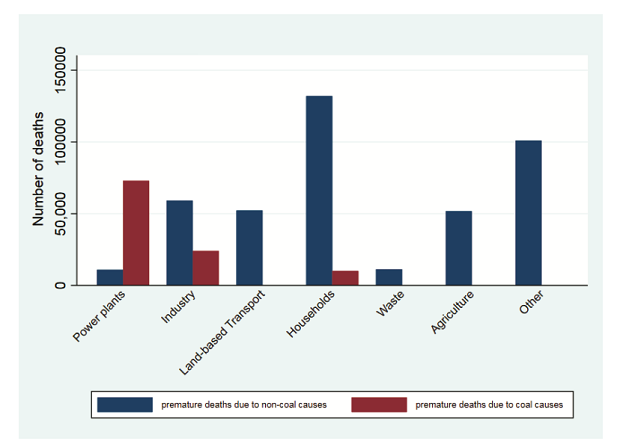 Pollution effects from coal alone are responsible for 107,000 deaths annually in India -- just under three quarters (73,000) of which are due to use in power plants, 24,000 related to use in industry and 10,000 from household coal consumption. Land-based transport is “responsible for a substantial number” of PM2.5 related deaths, comprising 12.5% of the annual total. However these emissions can be addressed through improvements to travel infrastructure. India’s urban population is growing rapidly, expected to increase by 416 million between 2018 and 2050, with a large proportion of the growth taking place in small non-Tier 1 cities. These cities should tackle the population’s transport needs through public infrastructure, limiting the rise in of car-users and keeping vehicular pollution at bay, the study suggested. 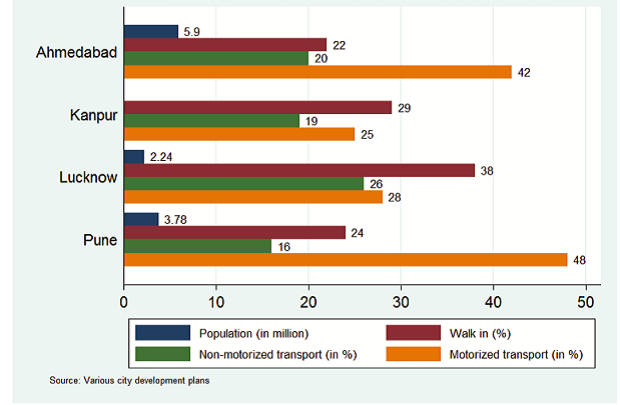 Ahmedabad and Pune, both cities “with a remarkable growth rate”, have high proportions of motorized transport users (vehicle users), representing 42% and 48% of all transport modes used. Raising awareness of such pollution-related issues, their associated health risks and climate change overall is a key way to mobilize preventative actions, the study said. Media coverage of climate change and health issues has increased by 40% globally over the last decade, buoyed by large increases in South-East Asia. The Times of India and Hindustan Times have shown a 458% and 415% increase in climate-related coverage between 2007-2017 respectively. Increasing regional, non-english media coverage of climate change and health issues across states can further help to stimulate a “state-by-state policy response”.